2 CYCLE 14 IN. CHAIN SAW is rated 4.7 out of 5 by 718. 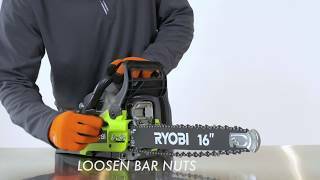 Rated 5 out of 5 by Old Mountain Man from Great tool for quick job I bought this 14" chainsaw last Friday (5-18-18) to help with building a 2nd shoot house for hunting on my property. The shoot house is deep in the woods and no electricity and a cordless circular saw can not hold up to the job. This chainsaw is awesome. After putting the bar oil in and filling it with Trufuel 50:1, I primed it as directions instructed, pulled choke out, gave it 3 pulls and pushed choke back in. The next pull had the engine running. I made quick work of my first several cuts and pushed stop button. The remainder of day, I used off and on with no failures to start, and made cuts I needed without a problem. Excellent tool!!! Rated 5 out of 5 by Lumber Jack from To Easy. I had a tree fall over in a storm last week and decided to tackle it myself rather than call out a tree service. My old 14in chainsaw was on its last leg and struggling to stay running and make cuts without bogging down. I took the opportunity to buy a new saw, I own a few of Ryobi battery tools and decided to buy the Ryobi 14in gas saw. Needless to say the first time starting it up and running it though a whole tree was a breeze. Never expected the initial start up to be so easy and the saw ran amazing. The user manual is also very easy to read and understand. You will not find another saw at this quality for this price! Rated 5 out of 5 by Trandall from Starts every time I bought this chainsaw last year and so far it has never failed me. I brought down huge dead branches off a walnut at my grandma's farm and proceeded to cut them into firewood lengths. Ran the machine all day long only refueling once, never had to tighten the chain, cleaned it up a little bit and stored in my shed for several months. Next time I took it out to help my neighbor bring down a small tree, fired right up and did a great job. I was actually surprised, as I had an old McCullough before and had to really work at it to get it going after storing it for awhile. Compared to what I was used to, this was a dream to use. Rated 5 out of 5 by Elmosmiley from Nice Machine Nice machine. I had an a company come in and do a large disposal project, as anyone would need. But I did have to cut up and clear a large portion, and by making it easier for the disposal company, the discount they gave me more than paid for this saw. 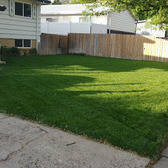 This is the perfect size saw for any homeowner who has trees in their yard - all need maintenance from time to time. You can do bigger jobs with this saw, I am sure, and probably load up a pickup or two with firewood (yes, we did that too.) Others who helped preferred the smaller sized lightweight saw to their much larger ones for this project. Easy to handle and maneuver. 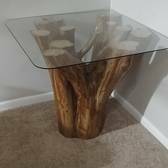 A must have for any homeowner with trees. Rated 5 out of 5 by Oldawg from Great little saw! I have several downed trees from hurricane Irma, some uprooted, some broken off - a real mess! I was using two larger saws - an 18" and a 20" which were heavy, loud and hard to start. 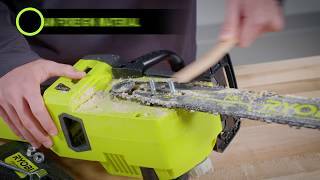 A neighbor came over to help with an old Ryobi 14" saw and when I saw how easy it started and the job it did, I went right to Home Depot and bought one. 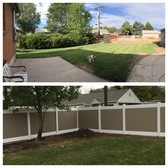 It did a fine job, lightweight and was priced right, so when a couple of other neighbors offered to help, I bought another one for them to use. My only complaint was the original chain didn't seem to hold an edge for long, so I put Oregon chains on both of them. Now I have no complaints! Rated 4 out of 5 by JimmyB from Perfect little Saw! I love it... needed a chainsaw in a pinch cause I heat with wood. Starts in 2 light pulls and can flood out if primed too much. Honestly I have cut 10 cord waiting for my other saws rebuild kit. I would recommend it. It's a home owners dream... 90+ octane, fuel stabilizer and 50:1 mix. No heavy smoke, no heavy over torque, all day long worker. Only negatives bar oil runs out faster than the gas so keep a watchful eye, the on/off switch failed so I have to choke it out to shut it off till I get a new one and the chain can loosen after heavy use so be mindful. All in all if they had a bigger CC saw I would get it. Rated 4 out of 5 by jjshot from Product works as described!! Have figured it out as a person who has used them before but never had my own. The brake release is understandably tight at first. Very tight and safety steps well thought through. Just wish there was a bit more about the orange chain block to newbies like me, I really didn't get it. The choke explanations and starting directions are great. I really like how you have thought it through, so I can start it, climb up a 14 foot ladder and then use it. I would only suggest you figure out how to have a center pull for ease, right now a right handed person pretty much has to pull on the left. Thank YOU! 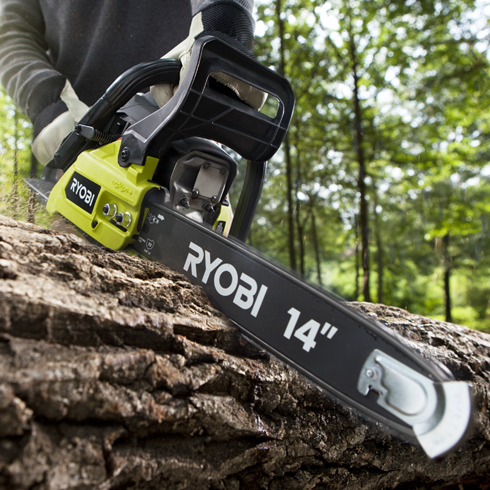 The RYOBI 2-Cycle 14" Chain Saw is the perfect saw for any homeowner. This unit comes equipped with a powerful 37cc engine and a 14 in. bar and chain! This saw also features an anti-vibration handle that will increase comfort and cut down on user fatique. 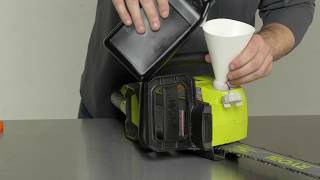 The automatic oiler will ensures that you will get the maximum life out of your chain. If safety is a concern, this saw has you covered. The chain break on this unit is inertia-activated and the end of the bar features a safety tip to protect against kickback. All of these features are covered by the RYOBI 3 year warranty.